Did you just buy an Android phone and is looking for the best apps to install on your new gadget to make it interesting? Or maybe you have been using Android smartphone for long and want to know about the must have apps for your Android phone. The ever-growing Android market is loaded with new apps every day, developers never cease to push the boundaries in creating and releasing apps that make life and work easier and fun. There are millions of apps on the Play Store but not all of them are crowd favorites. So in this article I am going to introduce you to some important Android apps you should have in your smartphone. 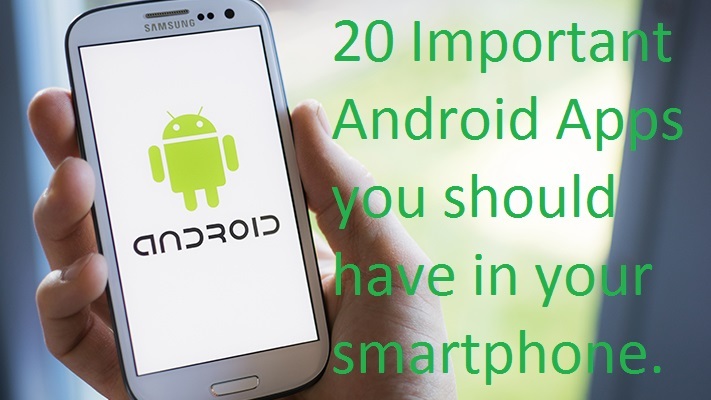 Important Android Apps you should have in your smartphone. CM Security AppLock & AntiVirus – This app secures your Android smartphone from viruses and help you manage your device better. Scan and remove viruses/threats from your device and SD Card, Clean up junks, boost memory/free up RAM, lock apps, block calls and locate phone if missing. Clean Master – This app boost your device speed and frees up memory, it also secures your Android phone from malicious apps and vulnerabilities, cleans junk files, boosts CPU and can also be used to quickly uninstall apps. You may pass on this one if you already have CM Security AppLock & Antivirus as both serves almost same purpose. DU Battery Saver – This app helps you manage background and running apps to save your battery juice. AirDroid – This app makes it easier to manage your Android device on the web. You can transfer files from your computer to your Android phone easily without USB cable. ES File Explorer File Manager – This is my favorite Android file manager for navigating and accessing files on my Android phone. Microsoft Office Mobile – This is the Microsoft office app for Android. With it you can view, edit and access Microsoft office document such as Microsoft Words, Excel, and PowerPoint documents on your Android smartphone. Adobe Reader – This app lets you read PDF documents on your Android smartphone. News360 – A smart news reader that aggregates news stories and blogs around your topics of interest. Appy Geek – This is my favorite geek and tech news app. If you are a tech-head then Appy Geek is a must have app for your Android phone. News Republic – The News Republic app is yet another must have app for your Android phone. Flipboard – Flipboard is the most popular way to catch up on the news, read stories from around the world and browse the articles, videos and photos friends are sharing. Shazam — Tap the Shazam button to instantly recognize music playing around you. TuneIn Radio — Listen to live radio stations and podcasts from all over the world. MX Player — This is the best video player for Android that lets you watch any video format. TrueCaller — Identify calls from unknown numbers and block SMS from spam numbers. Candy Crush Saga: This is my favorite Android game; you just can’t get bored with your smartphone if you have this app in it. Netmediablog – This Android App is the official app of the popular Tech blog – Netmediablog. So if you enjoy reading this blog, I recommend you install this app. Whatsapp – This is the most popular instant mobile messenger. If you want to keep in touch with most of your friends, then this app is necessary. Pixlr Express — A versatile photo editor from Autodesk that is absolutely free. SuperBeam — The easiest and faster way to share files between two Android device. If you’ve tried any of these apps out or you have another important Android apps you feel is worthy of a mention then post a comment and let us know about it. Great apps that you have listed but what about Ever note. Thanks a lot for another awesome post. I am already using some of your collections like CM Security, Clean Master, Pixlr express etc. CM security is a great tool with premium features as free. What about GO SMS, MDScan, QRDroid, Kingsoft office etc ? They do great work and really useful for our daily activities. Thanks Manoj these are also really awesome apps for Android, i have some of them on my device too and will love to check out the ones i dont have. Thanks for your contribution. Is the ES File Explorer available on Apple devices or strictly android? ES FIle Explorer is for Android though there are some awesome file explorer for iPhones out there.